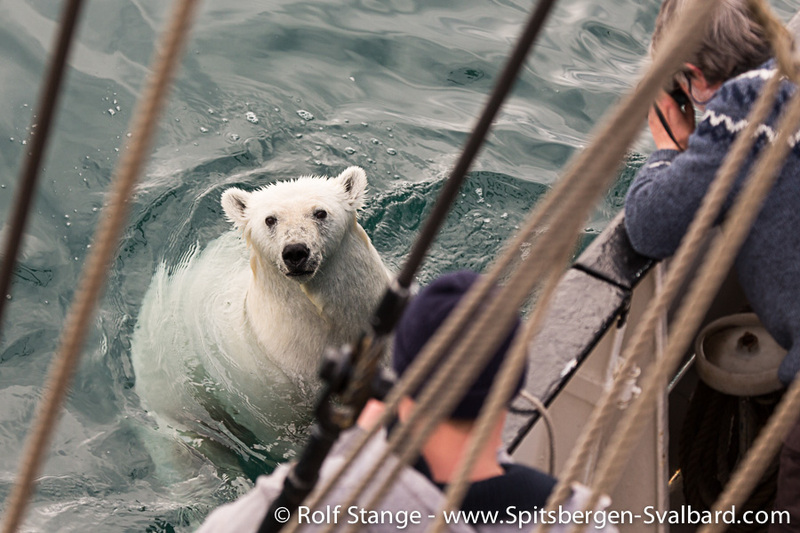 It is the dream of every Spitsbergen visitor to see a polar bear. But polar bears are huge and can be dangerous, and the very few attacks of polar bears on humans hit the headlines. 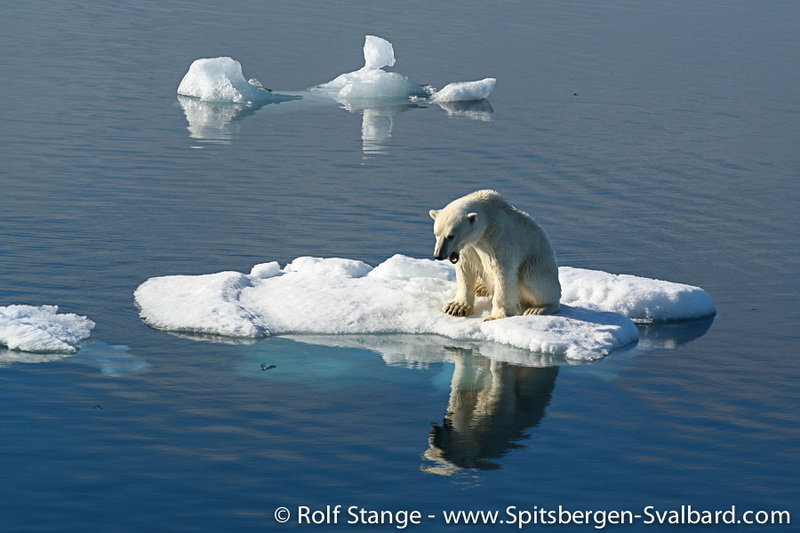 But The king of the Arctic himself is threatened. While hunting was a problem in the past, today it is dwindling sea ice and heavy metal pollution that could reduce stocks in the future. 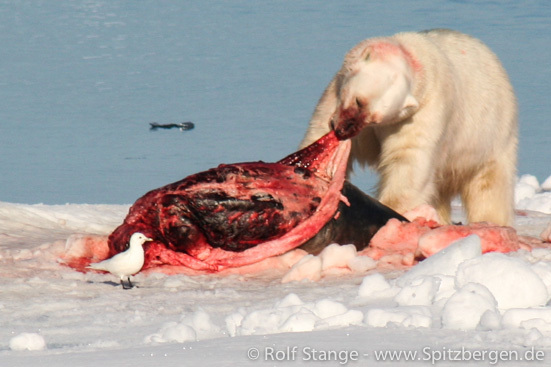 Polar bear with catch (Bearded seal) and Ivory gull. 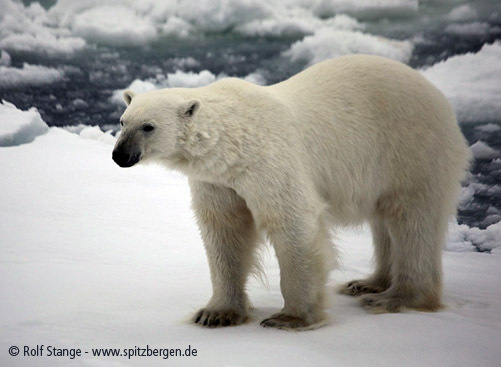 Description: The polar bear is the largest bear species on Earth. Males may reach weights of 300-700 kg (length from nose to tail 1.80- 2.60 metres) and females 150-350 kg. Weight varies greatly according to season and food availability. In 1995, a male bear was shot on Hopen that weighed 800-850 kg. The colour ranges from dirty yellow to creamy yellow to almost white, but never snow-white. 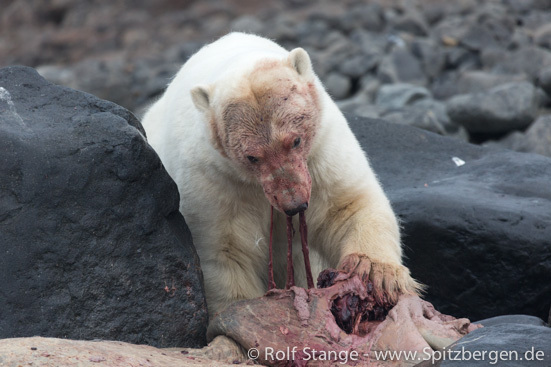 If a polar bear has spent longer periods on land, the fur will become dark yellow and during periods of starvation, when it neglects beauty culture, it will appear dirty and unsightly. Telling the sexes apart is anything but trivial, especially from a distance, and requires good observation opportunities and experience. Males grow larger, but how do you tell a sub-adult male apart from a large female? Males have a very strong neck and a broad skull base, females tend to have a (relatively!) slim neck and a longer skull. Pay attention to the bridge of the nose: It is shorter and often heavily scarred with males, but in comparison longish with females. 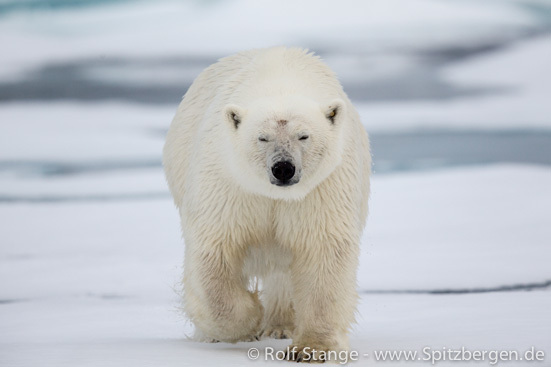 Male polar bear with strong neck, big and wide head and scars on the nose. 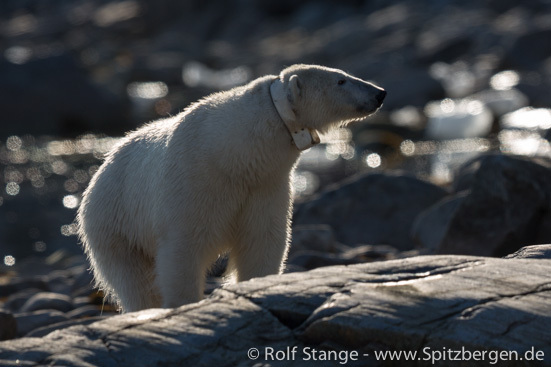 Female polar bear with slim neck and longish head. 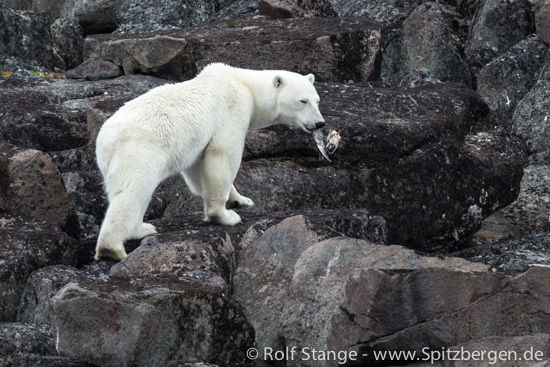 Distribution / Migrations: Polar bears have a circumpolar distribution in the Arctic, with several regional populations, but there is interchange between all areas. 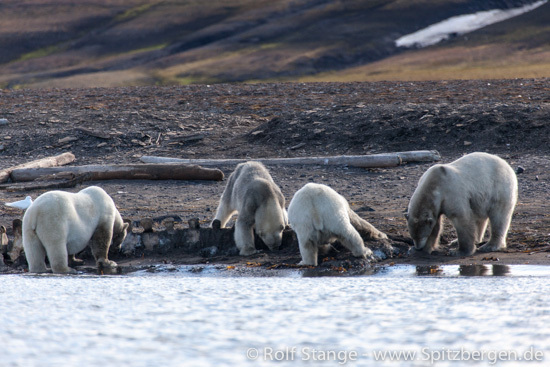 The Svalbard – Franz Josef Land area is considered one population, but exchange with polar bears further east in the Russian Arctic does certainly take place. A helicopter census in 2004 (213 flight hours) yielded a result of approximately 3,000 animals in the Barents Sea area, with an estimated 25,000 on a global scale. A further census in 2017 showed no significant change in stock numbers despite changing environmental conditions such as the dramatic decline in sea ice. 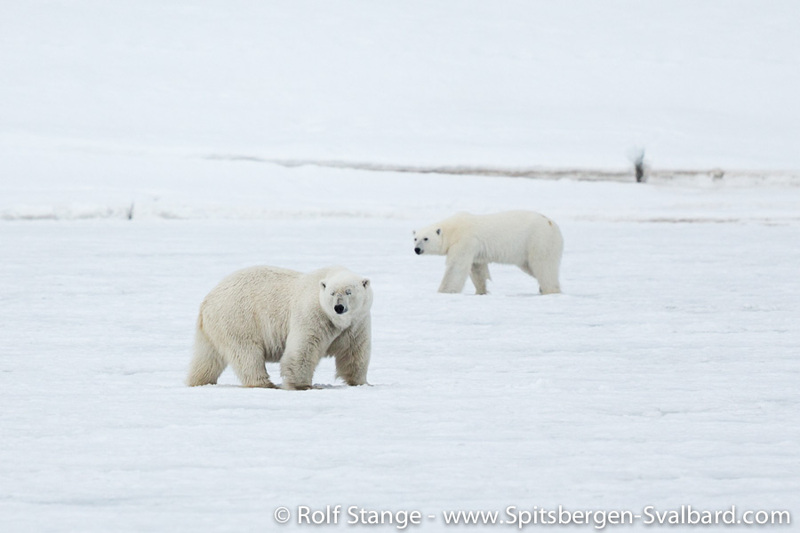 You have to expect polar bears anywhere and at any time in Svalbard outside the permanently inhabited settlements. The probability of meeting a bear increases towards the north and east. 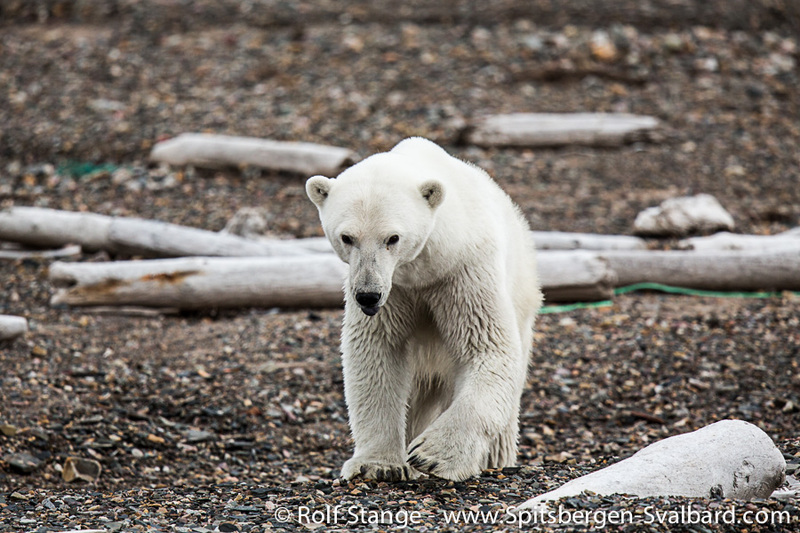 But polar bears have even been seen inside the settlements, especially in times of darkness. The highest risk to meet a polar bear on the road will be in the early morning, after hours with little traffic. 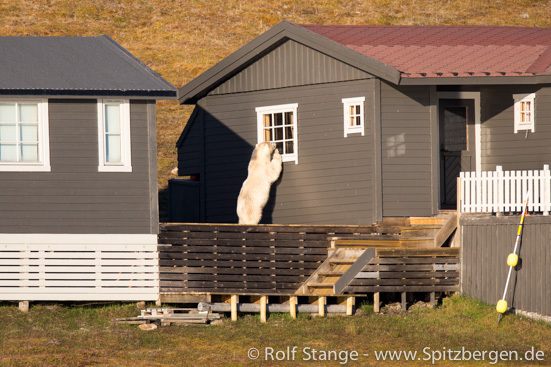 Curious polar bear checking out a hut near Longyearbyen. There have been 5 lethal polar bear encounters for humans in Svalbard since 1971. In 3 cases, the individuals or groups concerned did not have any weapon at all (Bjørnøya 1971, Magalenefjord 1977 and Platåberg 1995). In one case (Kiepertøya 1995), the group that was attacked had only a pistol with a calibre far too small. In the currently (November 2014) most recent case, in Tempelfjord in August 2011, it appears that potentially fatal mistakes had been made with securing the camp and handling the rifle, but this as, so far, not been officially confirmed. It is legally binding to carry polar bear deterrents, usually a heavy calibre signal pistol with special ammunition that makes a very loud bang. Pepper spray is discouraged by the authorities in Svalbard, although there have been cases when it may have saved a polar bear’s life. 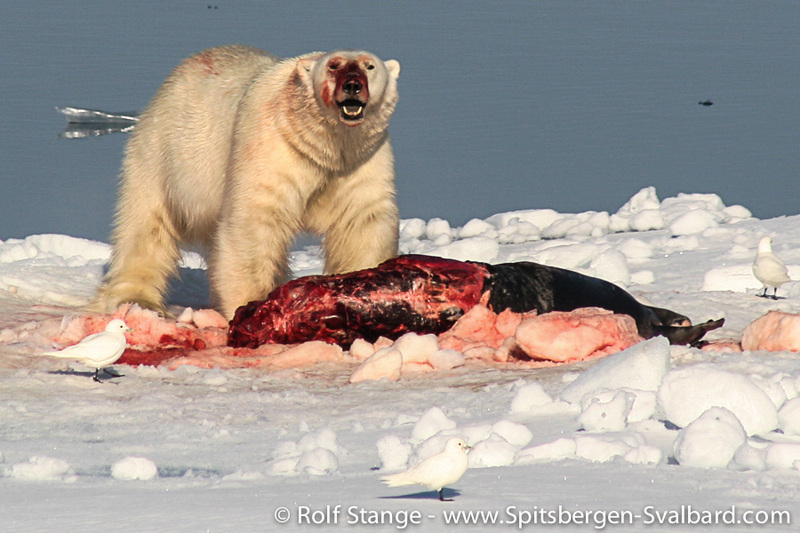 In April 2013, for example, a polar bear was shot from a short distance while it tried to break into a hut. Time would have been sufficient for a safe attempt to drive the bear away with pepperspray. Chances are good that this would have been very efficient, saving the bear and making it unlikely that it would go near a hut again soon. Of course, any attempt to stop an attacking polar bear on the open tundra with pepperspray would be extremely dangerous. When you meet a determined bear in open terrain, you want to have more than pepperspray in your hand. The best thing is the safety of a boat, as was the case when this photo was taken. 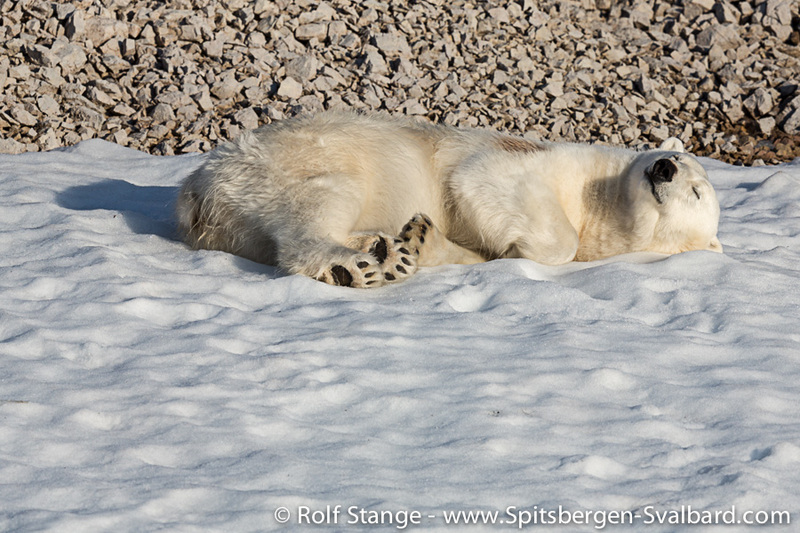 In Svalbard, polar bears are strictly protected and may be shot only in case of direct danger to human life or health. 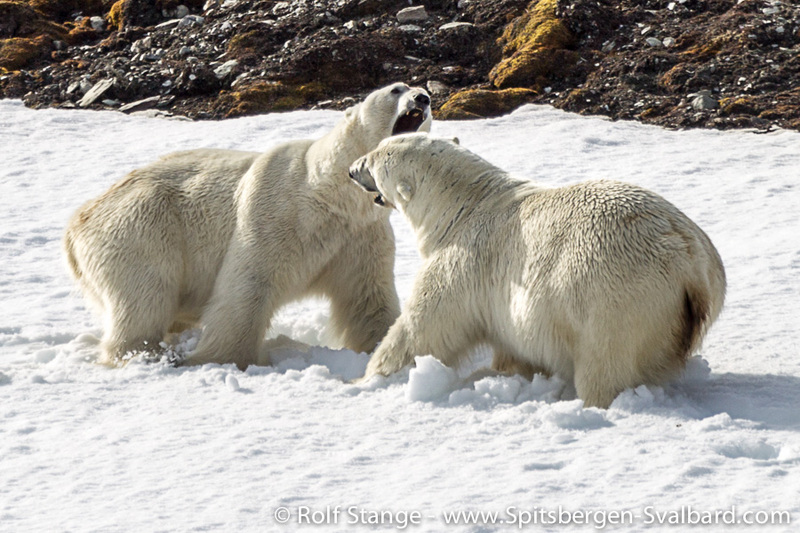 In most recent years, 2-3 polar bears have been shot in self defence in Svalbard, mostly by locals or scientists. Tourists, including guides, are responsible only for a smaller proportion of these cases. The number of bears shot in self defence seems actually to be declining, although more people are in the field today, including remote areas with higher chances of meeting polar bears. This is thought to come from a higher awareness and more experience today. 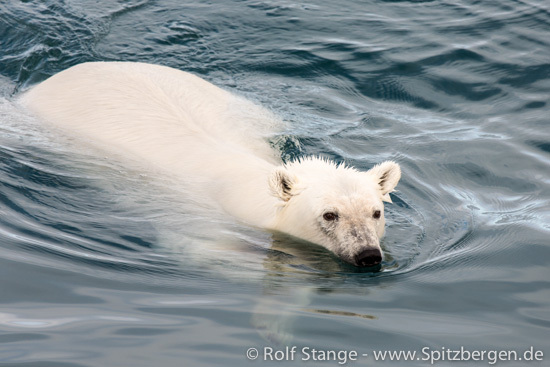 As the latin name Ursus maritimus already suggests, polar bears are marine mammals. They are great swimmers and can cover distances of many tens of kilometres without any problems; swimming distances of more than 100 kilometres have been observed. Whether these bears will be able to get back to land or ice is another question. Recent observations suggest that there is increased mortality due to drowning because of unintentional long-range swimming induced by decreasing sea ice cover in Alaska. 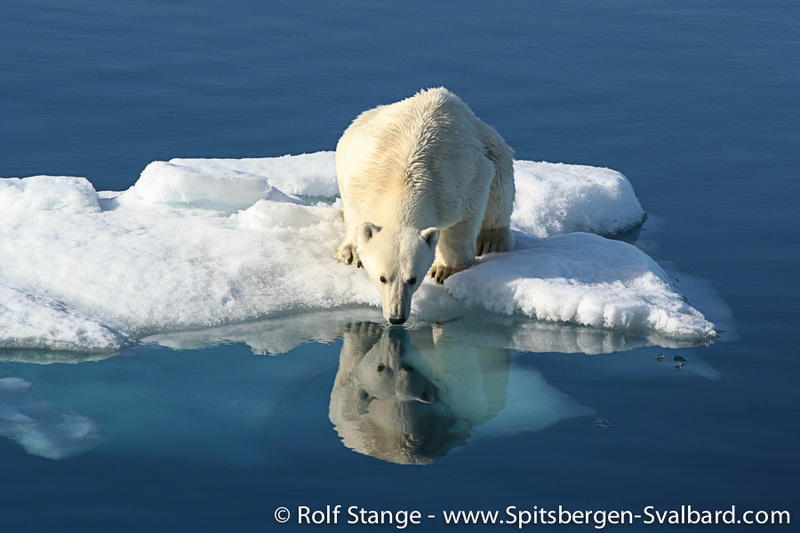 It is reasonable to expect a similar situation for Svalbard and this cause of death will increase in the future due to climate change with the obvious decrease in the sea ice cover around the islands and elsewhere in the Arctic. 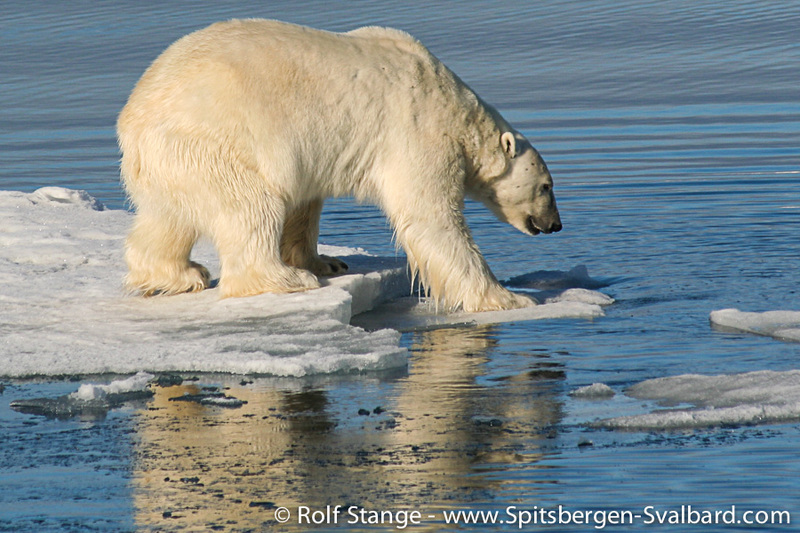 The true habitat of polar bears is dense drift ice. 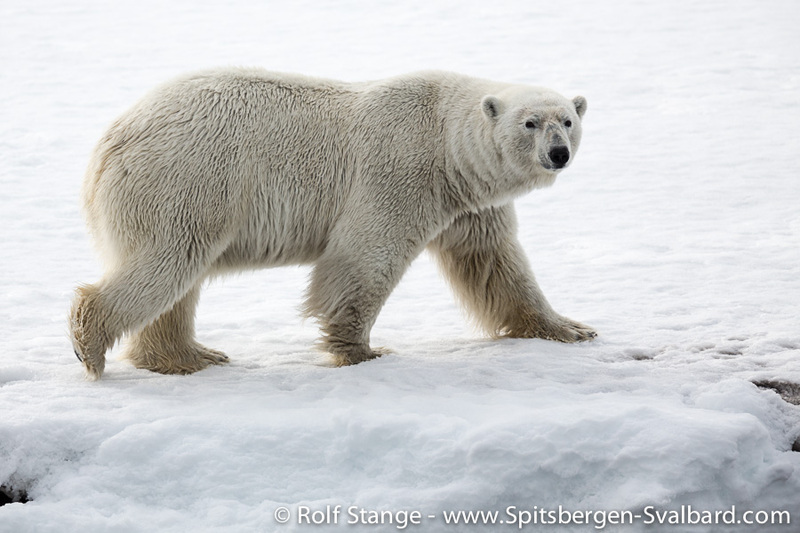 It is there and on the ice of frozen fjords and bays where they spend most of their life and find their most important prey: Bearded seals and Ringed seals, of which they need about one per week, or maybe more in the case of smaller Ringed seals. 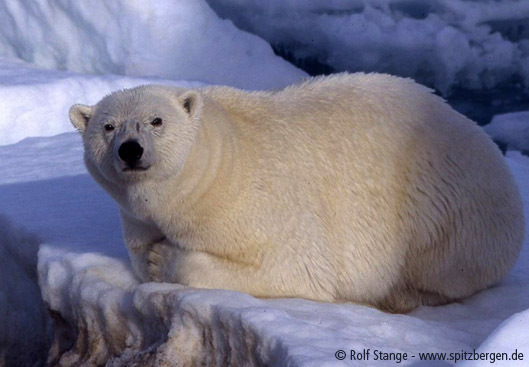 If necessary, well-fed polar bears with a thick layer of fat may survive up to eight months without food! Polar bears can walk immense distances on land and they are good climbers. A skilled hunter can also find food on land. In theory, a male bear never has to go back to land after he is born. 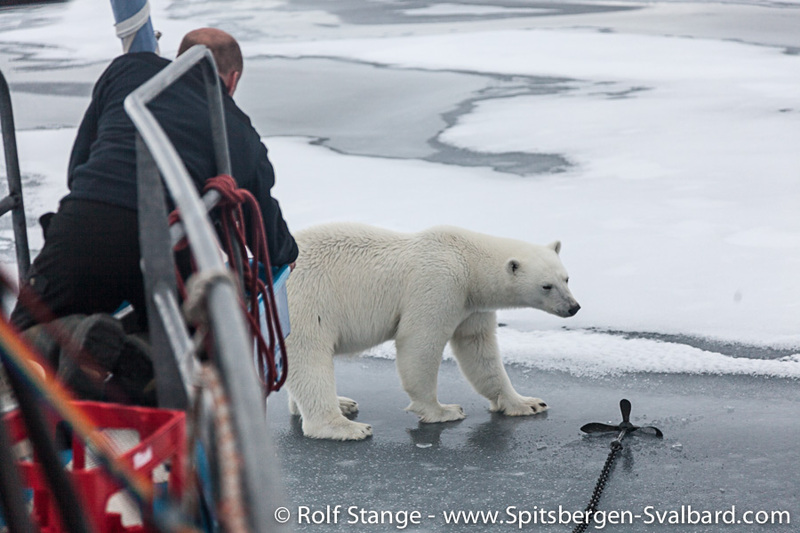 Some animals however stay on land, more or less intentionally, during the summer and wait for the ice to return. Some of them have adapted quite well and spend the early summer on small islands, plundering birds’ nests, or near glacier fronts trying to catch seals that are lying on small pieces of ice. Female bears seem to have stronger regional bonds, whereas many males show a very well-developed migratory behaviour and cover large distances, potentially roaming the whole Arctic. 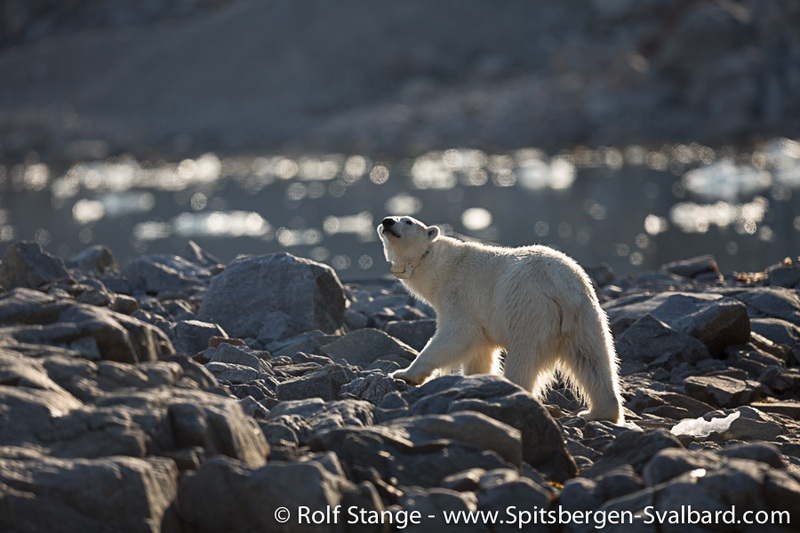 Some fjords in Spitsbergen seem to have small, more or less stationary populations, for example Liefdefjord, Raudfjord, Storfjord and, in recent years, polar bears were even having out in Billefjord for long periods. 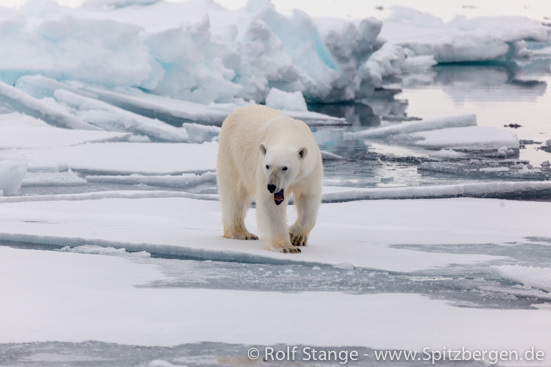 Polar bear in his element, the drift ice. Female polar bear with satellite tracker. 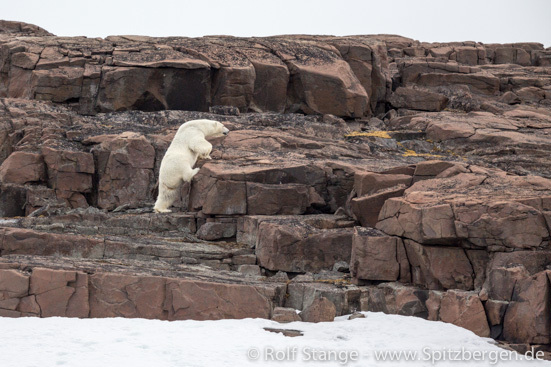 Polar bears are loners and do not usually tolerate the presence of other polar bears unless there is an overabundance of food, for example a beached whale. Females stay out of the way of males outside the mating season, as strong males may kill their offspring if they are hungry or as a precursor to mating. Even fully-grown females are not safe from aggression from their hungry, male counterparts. 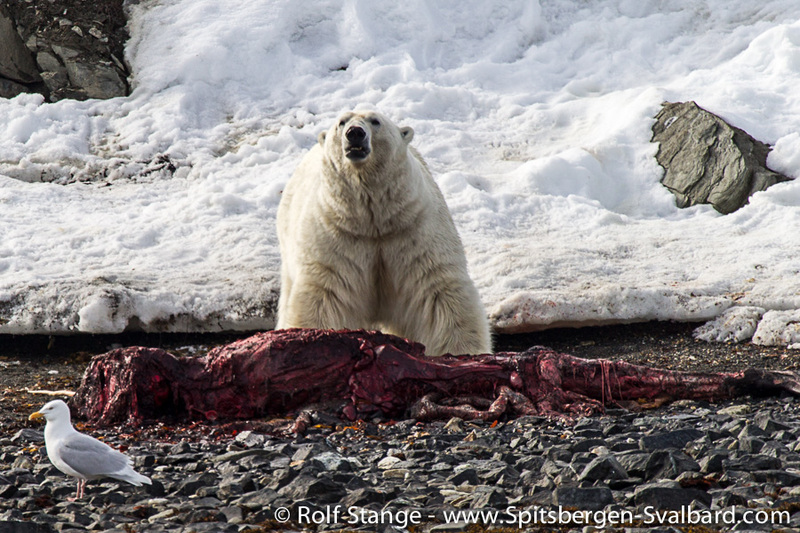 Polar bears with whale carcass on Edgeøya. Pay attention to the varying shape of the individual bears. Biology: Peak mating season is in April and early May. Females and males stay together for a couple of days for repeated mating and then go their ways. Strong males (ten years and older) may mate with several females, and females do not disdain mating with different partners. The further development of the fertilized egg is delayed until September, and in late December, two (rarely one, very rarely three) rat-sized, naked cubs will be born in a snow cave. Important denning areas are in eastern parts of Svalbard, on Edgeøya and Barentsøya, Hopen, Kong Karls Land and Nordaustland. The highest density of dens is on Kongsøya in Kong Karls Land with up to twelve dens per square kilometre! The young family will leave the den in late March or early April, when the female has not had any food for about four months, but has nursed the cubs during the same period. Good hunting results are critical and only experienced mothers will be able to raise both cubs to reach an age of one year. The young bears become independent at an age of two and a half years. Mortality is high again during the first year of independence, until they have got sufficient hunting experience. Once they have survived this stage, they have a reasonable chance to become 15 to 25 years old. 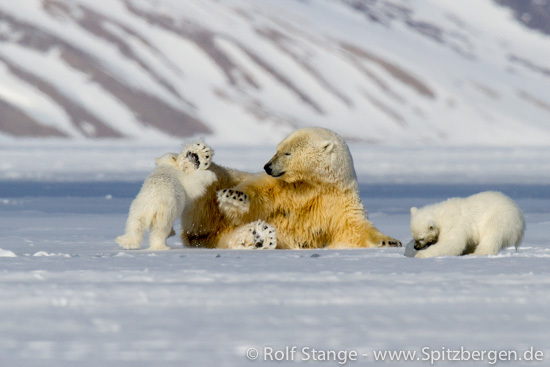 A young and happy polar bear family in Tempelfjord. The preferred food of a polar bear is a seal freshly caught on ice, but they are opportunists with an amazing range of technics to find food. They have been seen catching anything from walrusses, white whales, seals in open water and reindeer on open tundra to stealing chicks and eggs from nests. They will take carrion, garbage and vegetation – simply anything. Their range of hunting and other food finding tactics is surprising. 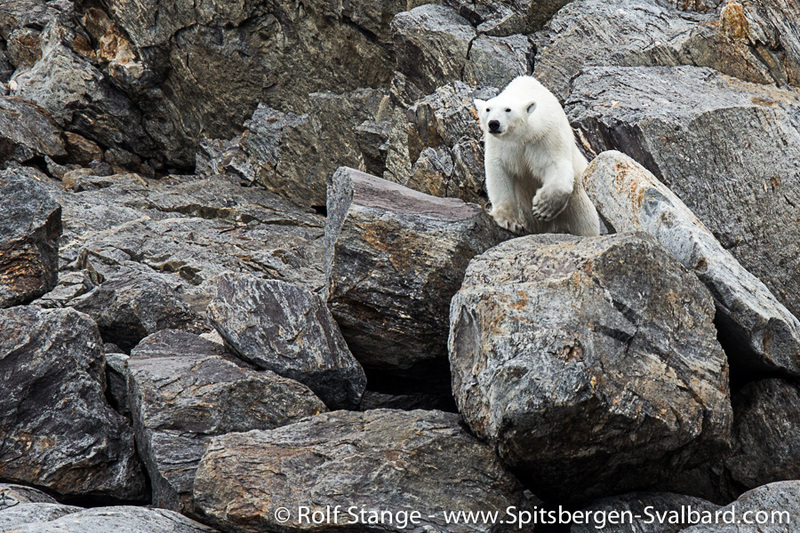 Polar bear with black guillemot, Heleysund. He probably found the bird dead. 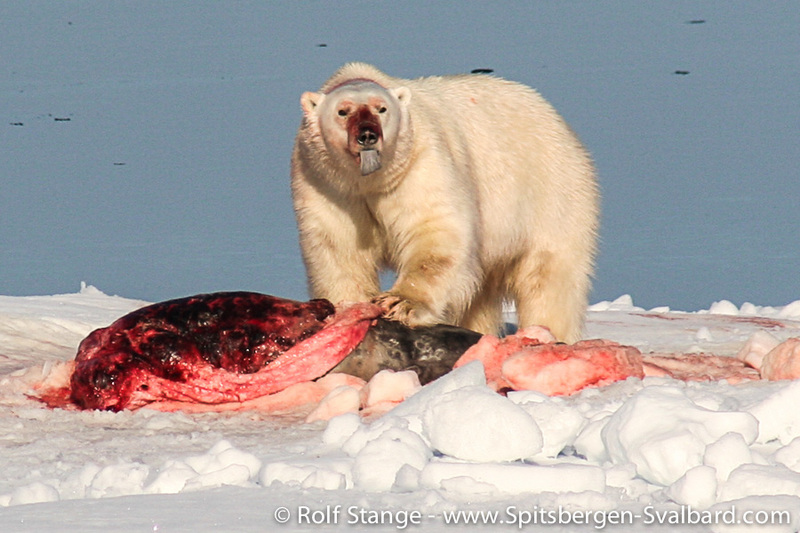 Polar bear with walrus carcass, Halvmåneøya. 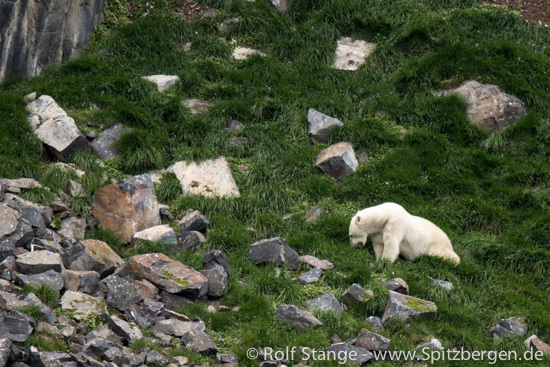 This polar bear is feeding on vegetation under a bird cliff on Barentsøya. Miscellaneous: In Svalbard, polar bears were hunted until 1973 when Norway followed other arctic nations in the protection of this species. Since then, they have been globally protected, with the exception of limited hunting by natives in Greenland, Canada, Alaska and Russia. Unfortunately, illegal hunting is still part of a polar bear’s real life: 200 to 300 bears fall victim to poachers each year in the Russian Arctic. This is, however, a regional problem without any implications for the global population which is threatened more by climate change and its dramatic consequences for the extent of the arctic drift ice, and by poisoning with environmental toxins (heavy metals, PCBs etc. ), that are transported by oceanic and atmospheric currents from industrial countries to the Arctic. Consequences include impairment of the immune system and decrease in fertility and, possibly, increased mortality of cubs. 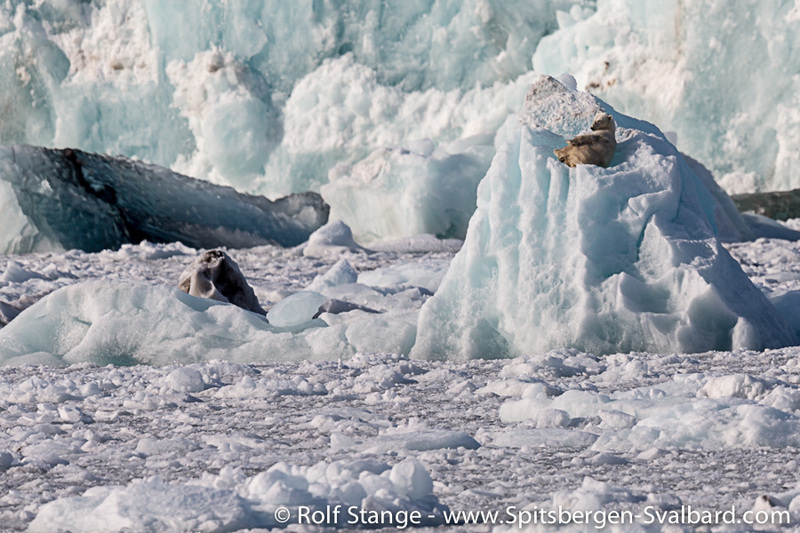 Polar bear surrounded by glacier ice in Hornsund.